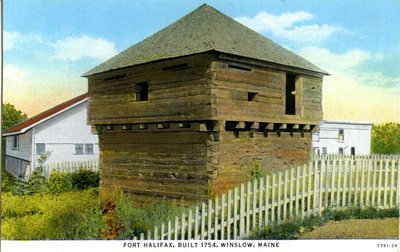 "Winslow, Maine, Fort Halifax Postcard "
An image scanned from a postcard of Fort Halifax, built in 1754, in Winslow, Maine. Fort Halifax was a fort on the north bank of the Sebasticook River, made out of timber logs. Printed by the American Art Post Card Company, Boston, Massachusetts. The postcard is not dated or postmarked.